To many, an industrial pump and compressor may be one and the same, but there are some differences that need to be noted to ensure that you’re purchasing the right equipment for the role you’re performing. In some instances a pump can carry out the work of a compressor and vice versa with some simple tweaks. While this can be true, those operating in the field will need to ensure that they have access to the right equipment. They will also need to ensure that the potential for anything to go wrong is minimised when possible. This is especially important within the HVAC industry, as safety and effectiveness are generally at the top of the agenda when visiting a customer’s home. The following advice outlines the differences between an industrial pump and compressor, as well as what type of equipment you should be purchasing for your particular role. A compressor is only able to transport gas because of the way it is designed. The compressor will take air from an outside source, and then pressurise the gas into a chamber which is then normally used for mechanical or chemical operations. If you operate within the HVAC industry, it’s likely that you will benefit more from a pump than a compressor, simply because of the way they are designed. Although it is possible for liquids to be compressed, it takes a great deal of pressure and doesn’t really reduce the volume of the liquid. As such, when moving liquids such as refrigerant, a vacuum pump is better suited to the job. Although a vacuum pump can transport gas, it can also be used to transport liquids. Given the many applications that pumps can be used in, many will find that they’re able to transport liquids of varying density, temperature and chemical content. A vacuum pump will take air from the environment via a low-pressure zone in the line and can transport liquid from equipment that vary in size, such as air-conditioning units. The fact that a compressor is only able to compress gas, it becomes clear as to why the right industrial pump become an important investment for a business or engineer. Both compressors and air pumps can be purchased for home use, but those looking for tools that can be used in a professional capacity will need to consider an industrial vacuum pump or compressor. Not only will this ensure that the equipment you purchase is suitable for your role but will be more cost-effective than trying to use a cheaper substitute. Why an Industrial Vacuum Pump is Suitable for HVAC? As engineers within the HVAC industry will be dealing with many different units, it stands to reason that they need a device that will serve them well in every situation. The limitations of a compressor mean that an industrial vacuum pump is the more viable solution. What Type of Vacuum Pump is Best Suited to My Needs? Although an industrial vacuum pump is ideal for those who operate in the HVAC industry, there are still some considerations to be made before purchasing a pump. The first thing you need to ascertain is the size of the applications you will be dealing with. It can be easy to assume that everyone should buy the largest industrial pump to ensure that that they’re always prepared, but in some instances, businesses could be spending more money than it needs to. Similarly, those who are trying to contend with large jobs using a household or smaller industrial pump could find that productivity grinds to a halt. Assessing the different applications you will be using ensures that you purchase a vacuum pump that is both reliable and robust. 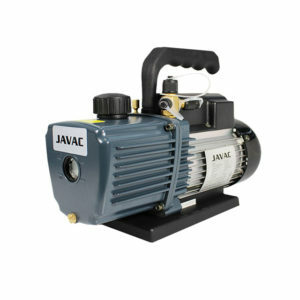 Retailing at $1,099.00, an economical vacuum pump is ideal for those looking to make substantial savings but should note that this pump will only operate at 160 litres per minute. This isn’t to say that this pump is of no use, but it should only be used for smaller applications. If you’re dealing with larger applications, then it’s likely you will need the device to move more liquid at a quicker rate, which will mean more investment. However, a industrial vacuum pump such as the Vector RD-320 can deal with 320 litres of liquid per minute, and while costing more, can be more productive than its smaller counterpart for larger jobs, meaning more customers can be serviced in a shorter amount of time. If you’re in any doubt as to what you should be looking for in your next industrial vacuum pump purchase, then it’s advisable to reach out to a seasoned professional who can offers some additional advice should it be needed. HVACTOOLS is a business that is owned and operated within New Zealand and offers customers a choice of different industrial vacuum pumps at varying price points. As well as only offering customers reliable and reputable pumps from recognised brands, we can even offer more powerful pumps at a customer’s request, so there’s never any need to search elsewhere.